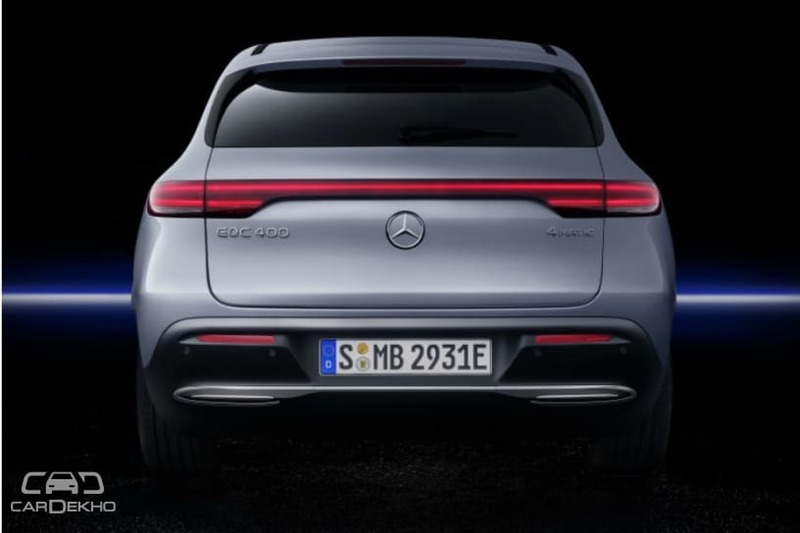 Mercedes-Benz EQC Unveiled; Rivals Tesla Model X, Audi e-tron. Daimler has now officially added another sub-brand to Mercedes-Benz’ kitty. The unveiling of the EQC 400 marks the beginning of the EQ sub-brand for the company. 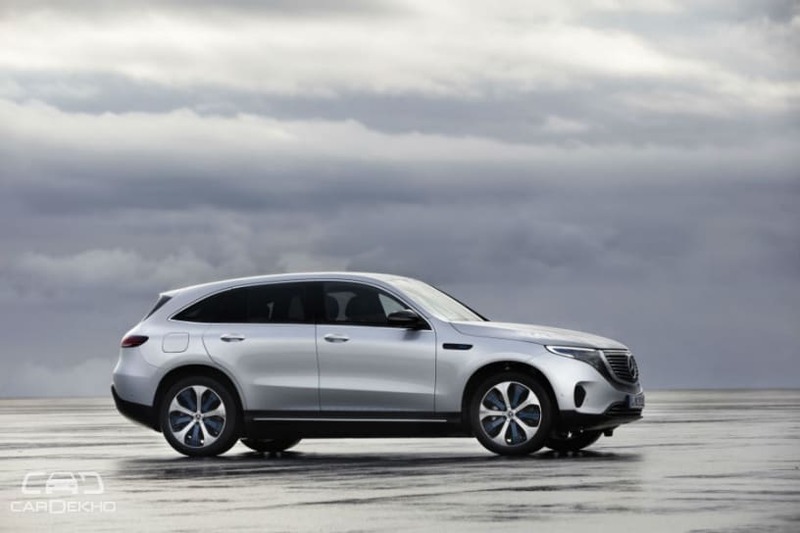 The production-spec Mercedes-Benz EQC 400 has been showcased in a special event held in Stockholm with production scheduled to start from 2019 at the Mercedes-Benz plant in Bremen. The EQC 400 looks muscular and contemporary with a coupe-like silhouette, similar to the GLC SUV. It gets MULTIBEAM LED headlamps flanking a two-step grille with the Mercedes logo at the centre. The headlamps are connected by an illuminated strip tucked on top of the grille and blends with the air inlets inside the bumpers. It gets 19- to 21-inch ‘bi-colour’ alloy wheels, while the resemblance to the GLC also comes to the fore in the side profile, thanks to the dropping roofline. The charging flap is placed on the rear right panel, above the fender. It features a roof-integrated spoiler at the rear with a connected tail light unit which extends to the side profile as well. On the inside, the EQC, as Mercedes says, features “avante-garde electro-look” with the MBUX user interface system. Just like the connected elements on the outside, the instrument cluster and the infotainment touchscreen are both 10.25-inch merging seamlessly to form a single slab. The dashboard also features open-pore wood while the seats get “Sunnyvale” upholstery in Indigo blue or beige colour with rose gold stitching. Powering the new electric SUV will be two motors placed on both the axles with an 80kWh lithium ion battery. The power output on offer is 408PS with 765Nm of torque. It helps the EQC do the 0-100kmph sprint in 5.1 seconds, faster than the Audi e-tron’s claimed figure. However, the claimed top speed of 180kmph, is lower than the e-tron’s claimed 200kmph. Mercedes-Benz is claiming a range of over 450km (280 miles), which is an internal testing figure based on NEDC (New European Driving Cycle). Inaccurate in the real world, NEDC has already been replaced by the WLTP (Worldwide harmonized Light vehicles Test Procedure) in Europe, which offers noticeably better and more realistic results. The WLTP rating for the electric Merc could be over 200 miles ~ 320-350km. The Audi e-tron, on the other hand, covers more than 400km (248.5 miles) on a single charge according to WLTP. The Mercedes EQC supports up to 110kW fast charging that can juice up the batteries from 10 to 80 per cent in around 40 minutes. The standard charger is a 7.4 kW unit suitable for AC home charging. EQ, according to the carmaker stands for “Electric Intelligence”. It will be produced on the same assembly line as the C-Class, GLC and the GLC Coupe. In terms of competition, the Mercedes-Benz EQC rivals the likes of the Jaguar I-Pace which is already listed on Jaguar’s India website, Tesla Model X and the soon to be unveiled Audi e-tron. With Mercedes-Benz’ grand plans regarding EVs in India, this could be one of the first entrants in the country from the carmaker.